Today’s macaroni experiment is based upon a recipe I found at one of those “once a month cooking” websites. I am not exactly Suzy Homemaker but every now and then I spend a weekend cooking like crazy and socking everything away in the freezer for future use. I love the idea of a freezer chock full of tasty, wholesome homemade stuff I need only thaw and reheat when I come home from a busy day at the office. But if this stuff were all that awaited me in my freezer, I’d probably stop for takeout on the way home. I revised the recipe slightly to remove the freezing-specific instructions. 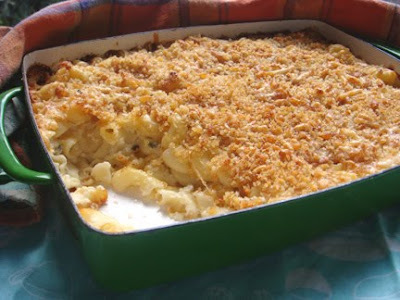 For example, the original text said to bake it without the topping, then put the topping on and freeze the casserole that way – I guess the logic is that the topping would be baked “fresh” when you reheat the entire mac later. This is a handy dandy tip I will try sometime, but on this day I just forged ahead. If I were to prepare this recipe again, I’d bump up the cheese quantity a lot. The quality of my Cracker Barrel Extra Sharp White Cheddar (green label) was surprisingly good – it had the right crumbly aged personality and an agreeably snappy taste, but there just wasn’t enough of it. And after baking, the “sauce” was non-existent. This mac baked up DRY. The sauce separated in the oven, too, perhaps because the recommended 400 degree heat is just too high. Next time I’ll set the temp to 350 and cook it a bit longer. It was only when I was sliding the casserole dish into the oven that I realized this mac lacks any real seasoning. The recipe doesn’t even call for salt, for heaven’s sake, much less the ubiquitous nutmeg or dry mustard. The result was a relatively taste-free macaroni and cheese, which I concede may be just the thing for families with finicky kids. But for adult palates, I believe this mac falls distinctly flat. Too bad, because it sure looked pretty coming out of the oven. 1. Preheat oven to 400 degrees. Butter the bottom of a large glass baking dish. 2. 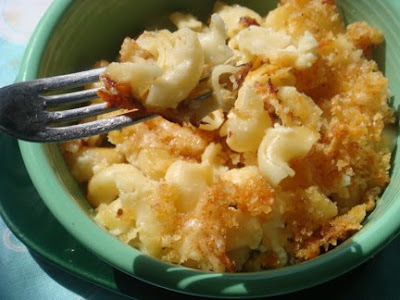 In a small mixing bowl, combine bread crumbs, Asiago cheese, and paprika. Set aside. 3. Cook macaroni per package directions. Drain. 4. Meanwhile, melt 6 tablespoons of butter in a large saucepan. Stir in flour. Gradually add milk, whisk until it begins to thicken - about 10 minutes. 5. Add Cheddar, parsley and pepper. Stir well until cheese melts. 6. Mix together pasta and sauce. Transfer to baking dish, dot with remaining butter and bake for 30 minutes. 7. Remove from oven and sprinkle top with bread crumb mixture. 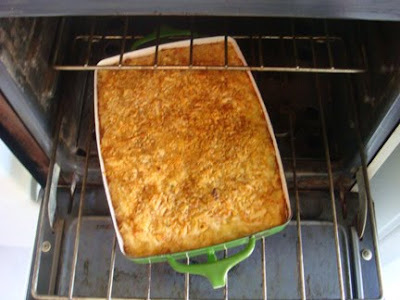 Bake for an additional 10 minutes or until topping is golden brown.